All is set for the much talk-about stage production as ace production house J-Nissi Productions brings to lovers a lovely season of love and laughter with a play for the love month. It stars ace acts Naa Ashorkor, Adjetey Anang and the young versatile actor Maxwell Beganim popularly known as Max Beg among other quality acts the movie industry has bore. 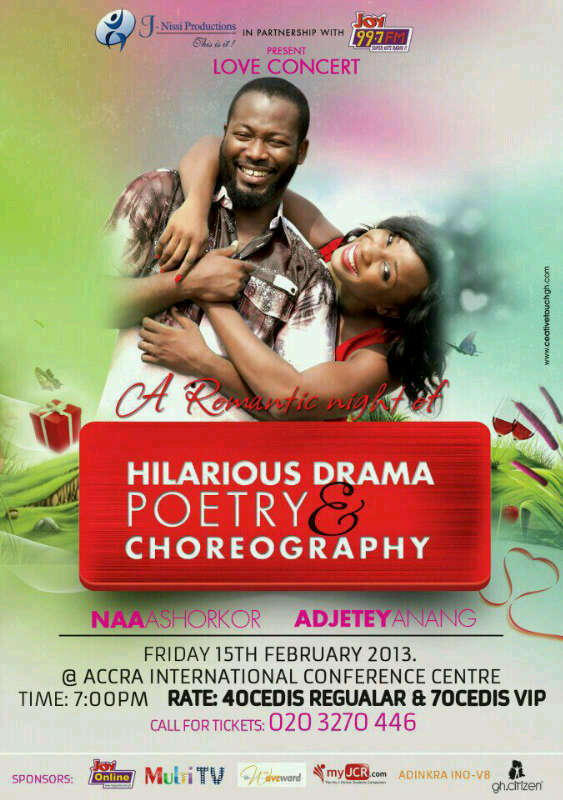 It will show on Friday, February 15 at the Accra International Conference Centre. Tickets are on sale at GHc40 regular and GHc70 VIP. Call 020-3270 446 for further information on the ticket. This event is brought to you in partnership with Joy 99.7 FM with Multi TV, GlitzGhana, myJCR.com, Waveword, Adinkra INO-VB, and gh.citizen supporting. J-Nissi production is noted for their unique and classic stage productions and producers promise a play worth watching over and over again show!